The time may arrive when you are caring for someone that you recognise you are no longer coping well. Perhaps you care for an elderly relative who is still living independently in their own home or a spouse or child with whom you share your home. Carers often feel guilty and don't know where to turn when they come to the conclusion that the intensity of their caring role can no longer continue. If you are in this situation, you must remind yourself that you are not super-human and that you are only able to do your best. If you carry on caring when, realistically, you no longer can, you may become ill or start to resent your loved one - neither alternative is acceptable and you must ask for help. Who Can You Ask for Advice? Hopefully, you will already have had a Care Assessment and Carer's Assessment and hence, a social worker or care co-ordinator to whom you should turn for advice. If not, make urgent contact with your doctor and explain your dilemma. Either a more comprehensive community care plan will be put in place to help you or alternative suitable accommodation for your loved one should be considered. If this is the most appropriate action, you and your loved one will face an emotionally difficult journey in coming to a decision about where they should live. If you have been looking after a grown up child with disabilities, or a parent who has become increasingly incapable of living independently in their own home, you may consider Sheltered Housing. Sheltered Housing offers people the chance to continue to live independently but with the comfort of knowing that in the case of an emergency, there is someone on hand. Managers or wardens either live in or nearby the housing scheme and an alarm system is usually incorporated into the design of each housing unit. Often the accommodation comprises of a studio flat or small apartment with communal leisure areas where regular activities are offered to residents. Residential Homes may be the appropriate solution if your loved one needs more hands on care or suffers from a progressive illnesses such as dementia or MS. Some residential homes are only suitable for people who can look after their own personal needs but others also offer nursing care if a person's health deteriorates. Involve your loved one in all decisions. Make sure they understand that you still love them and are only seeking to make changes for their own welfare. If necessary, garner the support of your doctor and social worker to support you in explaining your dilemma to your loved one. Think about your loved one's future care needs. If you feel that their health may worsen, consider what alternatives may become appropriate in the months or years ahead. Seek legal advice about any contract undertaken with a vendor and/or management company of a sheltered housing scheme. Look carefully at the location of the accommodation and whether it is practical for you to visit your loved one and for them to continue with any hobbies or activities they currently enjoy. Visit several schemes before making a decision and check out the atmosphere. The general feeling of a place rather than its fabric is more important to ensure the future happiness of your loved one. First impressions on entering an establishment are often correct. 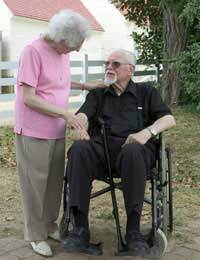 Many adult children feel it is their duty to offer to accommodate an ailing parent. However, once the decision is made, even if the outcome is unsuccessful, it can be very difficult to change. Remember to consult all members of your household and others in your family before making any offer and weigh up all the pros and cons prior to making a decision. If, living apart, you don't always get on well with your parent, it is very unlikely that the relationship will improve once you are both under the same roof. After consideration, if you do take this route to accommodate a parent, seek legal advice with regard to the tenancy and ownership of your property especially if your parent sells their home to come and live with you.